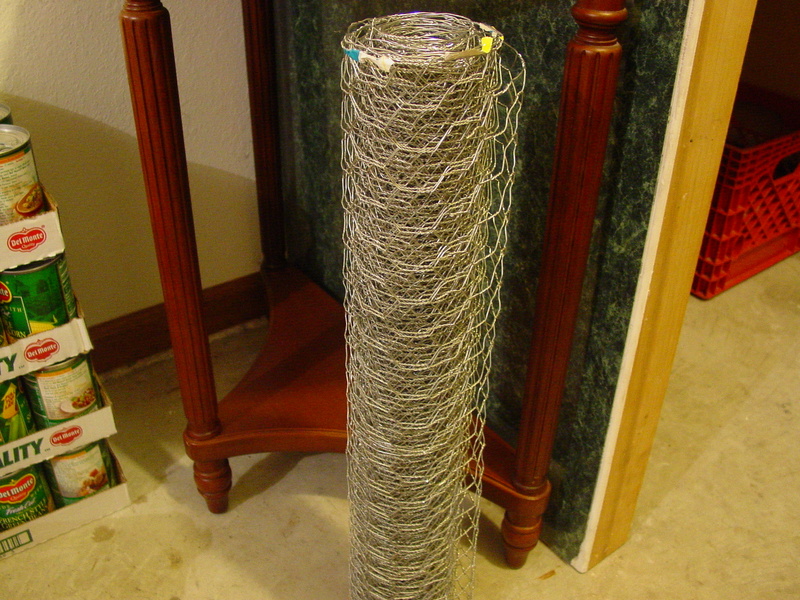 Lo and behold, one day he came home with chicken wire. I thought it might come in sheets or panels, but no. It came in this giant roll. It’s a little bit flat out intimidating. So, I did not use it for quite some time, but the hot, hot weather here has driven me right past fall and into dreaming of a white Christmas. My searches at garage sales and thrift stores have yielded an entire closet full of Christmas junk treasures. I faced a dilemma; make something or throw some of it away. For two dollars, I had purchased a square thingy with gold leaves all around it. At another yard sale, I bought a little ring of glass beads. I’m working on some much larger pieces that require paint and stain, and I thought I might use these as accents, but the tones didn’t match. 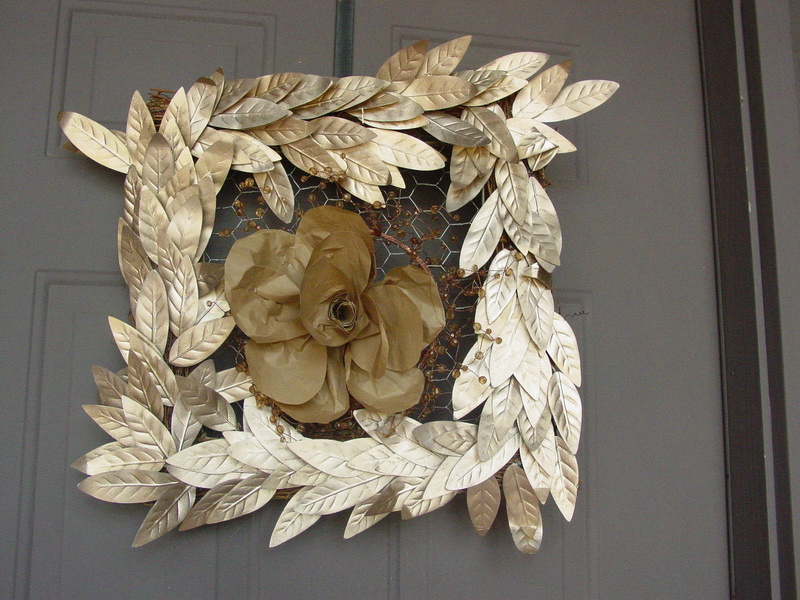 I decided to put the two together to make a wreath or door hanging, and it would require putting the chicken wire on back. (You thought I had forgotten about that, didn’t you?) That’s how I came to the title of this post. That chicken wire is for the birds! First, you can’t cut it with scissors. Well, you can, but then you have to buy new scissors. 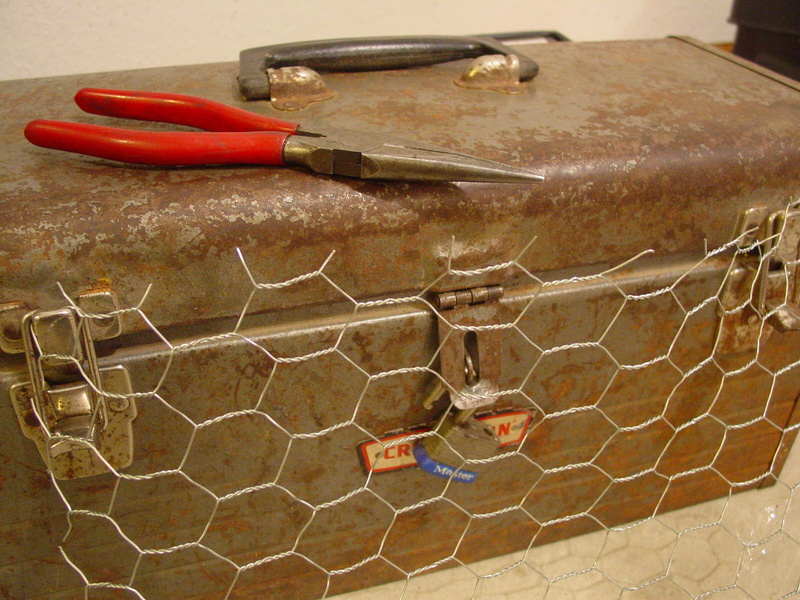 This required a trip to Saint’s old Craftsman tool box for the wire cutters. Several band aids later, I have this little piece of wire and no fingernails. The good thing is, those spiky things make it really easy to attach to other things. Now I had a square of gold leaves with a circle of gold beads, and nothing in the middle. Until…I remembered a project from last Christmas. 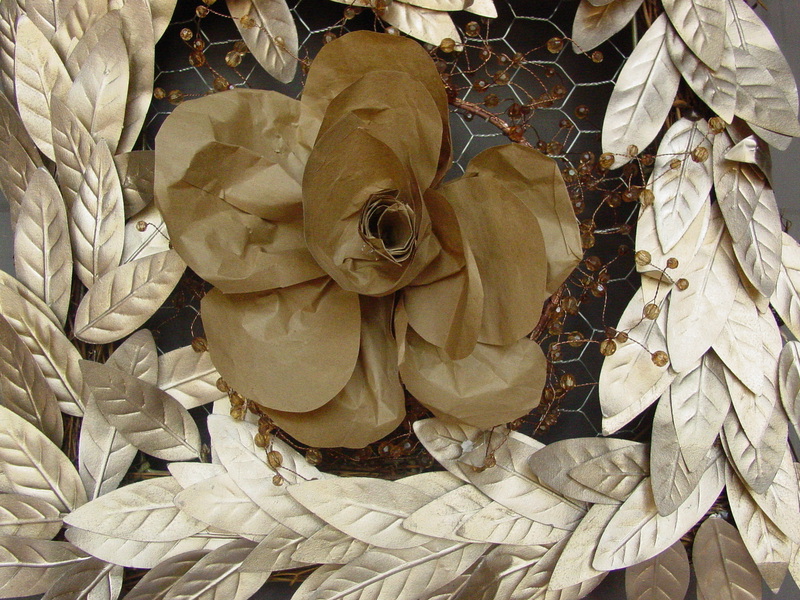 Paper flowers are all over Pinterest, now, but these made out of brown bags are my favorites, and it was perfect for the center of my wreath. Looks pretty nifty for a thrifty three bucks, wouldn’t you say? Here it is hanging on my door. Maybe with a little greenery? Or maybe it’s the 102 degree temperature. Actually, I think it is just not right with my door color, but I’ll bet it will look absolutely amazing with the other Christmas things I’m working on for the flea market booth. I’m planning an awesome Christmas display, and I can’t wait to show it to you in November.